Dr. Kelly Scanlon (senior research scientist, Environmental and Energy Management Institute) participated in two workshops in Washington, D.C. during the week of March 12: the Materials Life Cycle Tracking and Measurement Workshop hosted by the U.S. Environmental Protection Agency, and the Federal Life Cycle Assessment Commons Technical Working Group meeting hosted by the U.S. Department of Agriculture. Both workshops offered networking and collaborative opportunities to work together to identify technical and policy solutions for challenges in tracking chemicals and materials throughout the supply chain. CEE senior Edna Aguilar received the ASCE-NCS 2018 Outstanding Senior GW Award. 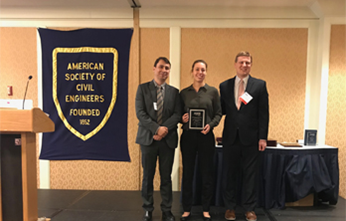 The American Society of Civil Engineers (ASCE) National Capital Section (NCS) held its annual banquet on March 20 at the Arlington Hilton Hotel. At the banquet, the chapter recognized three outstanding CEE students with awards. Edna Aguilar received the Outstanding Senior GW Award; Yoon Sil Choi received the Hathaway Memorial ASCE NCS Award/Scholarship; and Kelsey Donoghue received the Hummel Memorial ASCE NCS Award/Scholarship. Dr. Samer Hamdar (CEE) is the advisor to the GW chapter of the ASCE. This semester's Linux workshops will be held on Fridays from 10:00 am to 12:00 pm in Tompkins Hall 411. They will be hosted by SEAS Computing Facility Systems Engineers Marco Suarez, Hadi Mohammadi, and Jason Hurlburt. Please email [email protected] with any questions or comments about the workshops. This event brings together female engineering students and SEAS alumnae to discuss navigating one’s career successfully. Hear from our key note speaker Christyl Johnson, Ph.D ’12, deputy center director for technology and research investments at NASA’s Goddard Space Flight Center; engage in round table discussions; share lessons learned; and network with fellow classmates, alumnae, and SEAS faculty. This event is open to both undergraduate and graduate female SEAS students.